It's October and I often think of all things spooky, supernatural and otherworldly up until Halloween. 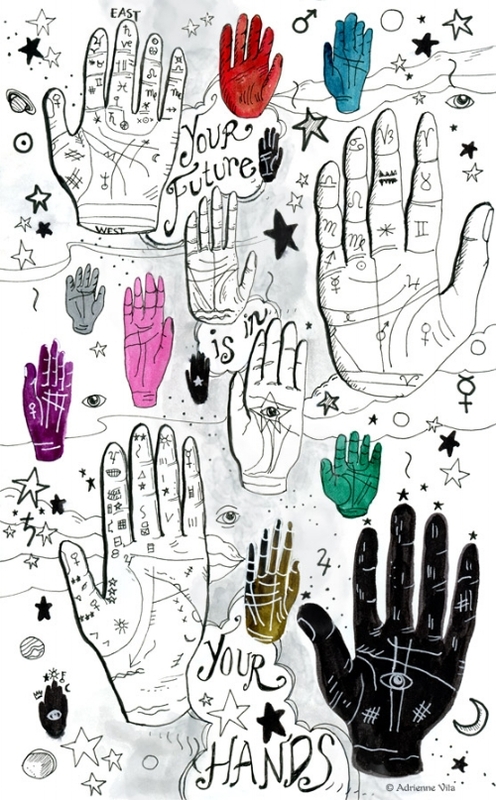 I was thinking about Palmistry this week and how kooky it is. I love hands and I think it's fascinating to get intuitive impulses by looking at the lines of someone's hands. Palmistry is not my personal forte but I did study it briefly a long time ago. Palm readings are a fun quick thing to do with your friends and typically are pretty cheap. I've had my palm read about 3 times in my life and I'm pretty good at feeling out if a reader is good - so overall my experience with palmistry has been pretty good. One way to know to spot a good reader is; if the place or person feels really good, then go for it. If you are having any sort of hesitation, trust your gut and move on. The main thing is to not take it too seriously and realize that no matter what you hear, the future is always within your power. So, here is some art inspired by the many lines in our hand, fortune telling, all things mystical and the truth that "your future is really in your hands". Have you ever had your palm read? I'd love to hear your story in the comments below.